The Hensons generally went to Vermont to ski, most frequently to Stratton Mountain near the Stones’ house, and a couple times to Okemo and Killington. In 1975, when the Muppets’ appearance on a Julie Andrews special (taped in London) conflicted with the family’s Vermont plans, Andrews arranged for them to all ski at Gstaad in Switzerland. Another year, their cold-weather destination was Mt. Tremblant in Quebec. These ski trips were a real break from routine, and they gave Jim a chance to enjoy his family and spend some time relaxing in nature. And despite hurting his ankle during the 1974 Stratton trip, Jim and his family continued annual trips through the late 1980s. 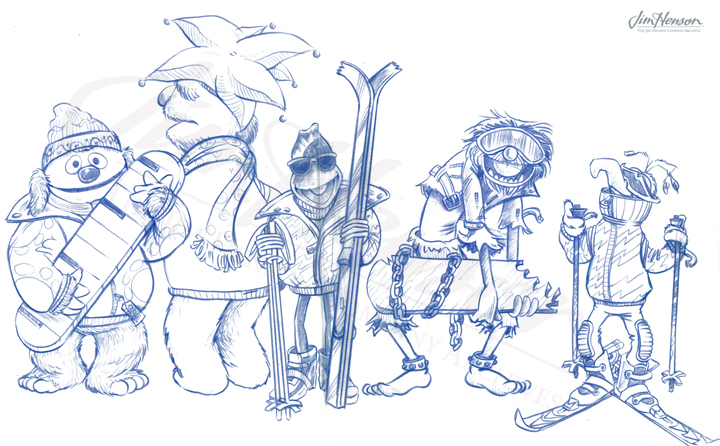 The Muppet gang ready to hit the slopes. Gonzo enjoying a winter outing. 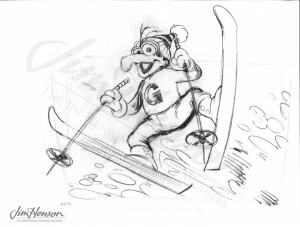 This entry was posted in 02-February '74, 1974, Family and tagged Gstaad, Jon Stone, Julie Andrews, Killington, Mt. 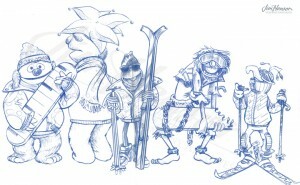 Tremblant, Muppets, Okemo, Sesame Street, Stratton, Vermont. Bookmark the permalink.